During Black History Month, some of the most renowned cultural attractions in Baltimore are offering special tours, lectures, performances, film screenings and other events that portray the historical and cultural achievements of African Americans in Maryland. A special exhibit this year is a sealed time capsule, discovered on October 16, 2014 in a wall of Baltimore’s own Washington Monument that has been undergoing renovation. Historians believe it was placed there during the city’s Centennial celebrations in 1915. Contemporary accounts suggest the welded copper box contains materials relating to the 1914 Star-Spangled Banner Centennial Celebrations but we won’t know till it’s opened on July 4. Meanwhile, go by the Walters Art Museum to guess what’s inside the sealed box. The Reginald F. Lewis Museum, the largest African American museum on the East Coast, focuses on the contributions of African Americans in the arts with programming for the whole family. While still celebrating the sesquicentennial of the Civil War, the museum has a special show of Art from Sub-Saharan Africa and another — For Whom It Stands: The Flag and the American People — about the U.S. flag. According to the museum, the flag celebrated by the “Star Spangled Banner” was partly sewn by an indentured servant from Baltimore. Last year marked the 200th anniversary of the national anthem composed by Francis Scott Key to honor the seige of Fort McHenry. There are special activities every weekend in February. The B&O Railroad Museum in Ellicott City will open a new exhibit that celebrates the contributions of African Americans — often porters, chefs and waiters in the dining cars when the railroads were segregated — to the railroad industry. On the first Tuesday of the month, all visitors pay only half price, and on Wednesdays, Toddler Time returns for train-themed storytelling, play time in the Choo Choo Blue Kids Zone and a special carousel ride. Thomas the Tank Engine programs return in late April. On first glance, the large and elegant Georgian mansion at the Hampton National Historic Site in neaby Towson, Maryland looks innocent enough. But up until 1829, what was then the Maryland governor’s mansion was home to more than 300 slaves. A fascinating look at rural Maryland life during the 19th century. Other great attractions to celebrate Black History Month in the state of Maryland can be found in the Maryland Tourism office directory. 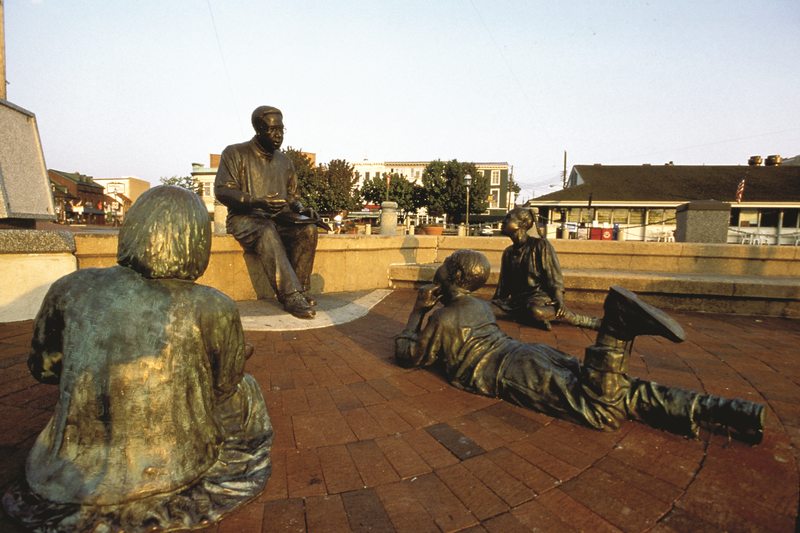 The author Alex Haley is commemorated in a life-size sculpture in Annapolis that honors Kunta Kinte, the hero of “Roots” (pictured above, photo courtesy Maryland Office of Tourism). Special exhibits will be running at The Baltimore Museum of Art, The Baltimore Civil War Museum, the National Great Blacks in Wax Museum, the Eubie Blake National Jazz Museum and Cultural Center, and the NAACP Headquarters. You can also download a tour map of Maryland and the Underground Railroad and plan your own family road trip. To learn more about these and other great family attractions, read FTF’s Baltimore Family Guide. Thanks to the contributions of Thurgood Marshall, Billie Holiday and Frederick Douglass, African American history is always alive in Baltimore. But February, which is Black History Month, is being celebrated as the Febulous month, with a site called AbsolutelyFebulous.com The site brings together and showcases news and discounts that are part of the city’s Restaurant Week, Hotel Week and Museum Week in one promotion that runs Presidents Day weekend through month’s end. Hotel Week features nearly two dozen hotels and B&Bs offering packages starting at great rates. As a Febulous bonus, one-night bookings earn a $25 gift card and two-night stays get $50. Book your package or winter getaway through Visit Baltimore and receive additional savings such as the buy one, get one free offers on the Harbor Pass and Legends & Legacies Heritage Pass. Click here for our reviews of Where to Stay in Baltimore. There’s tons to see while in town, and the top sites are offering buy one, get one free deals that equal 50% off. Lastly, if you’re traveling to Baltimore by train, your companion can save 30% on their Amtrak ticket. Note that visitors from Washington DC can now take the weekend MARC service to Baltimore’s Penn Station. To make your visit totally stress-free, hop on a Bolt Bus or Megabus from the major mid-Atlantic and Northeast cities and let someone else drive.